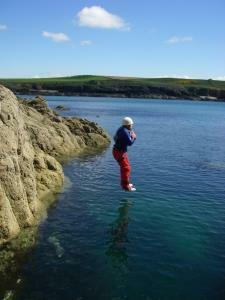 Coasteering at Bach Ventures at Bach Ventures Ltd CoasteeringCoasteering off the coast of Anglesey is truly a treat. The coast line and wild life found around here provide the idea setting for some fun. We start gradually getting used to our new surroundings from simple traversing and hops across gaps to interesting swims in zawns and exploring our own limits of comfort. Explore the Angelsey coastline from a different angle. We traverse along the coastline, sometimes swimming across zawns, jumping in pools above all having a fun day out. from £45 per person, discount given to groups above 10 persons.